Anchor chain has a tough life, particularly on liveaboard boats that might spend half the year or more at anchor. Although it is becoming more common to see stainless steel chain on yachts it is true to say that the vast majority of chain used by yachtsmen is zinc coated to provide corrosion protection. The zinc forms an anodic coating, gradually corroding while protecting the steel of the chain. Zinc is also lost by wear, both against the seabed and during the launch and recovery process. Eventually the steel is no longer protected, as indicated by rust on the chain, unsightly stains down the decks and perhaps down the topsides. 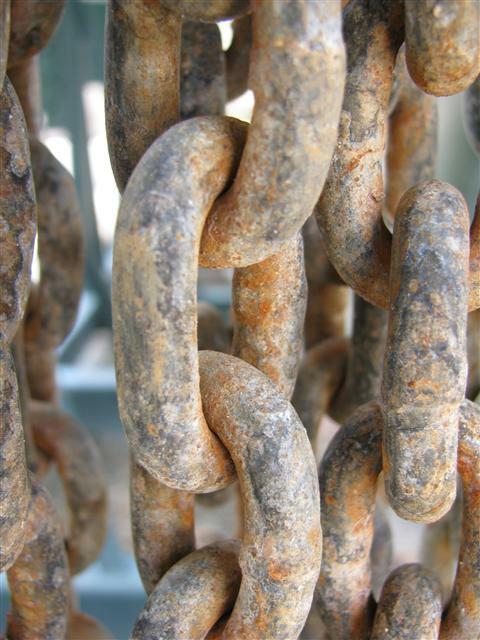 The unprotected steel chain now becomes susceptible to rapid loss of section by corrosion, around 10% loss being regarded as the maximum acceptable before its strength is compromised. My chain was bought in Corsica at the beginning of the 2007 season. When I collected it I was rather disappointed to find that the zinc layer appeared thin and I expected its life to be short. At the end of the 2008 season I reversed it when the zinc on the more frequently used half appeared to be almost gone. Its condition deteriorated rapidly and by the end of 2009 half the total length of 60 metres was almost devoid of zinc and the remainder was little better. I decided that it was time to look into re-galvanising it. My first move was to cost re-galvanising for comparison with buying new. Galvanising companies I contacted quoted roughly £1/kg (plus VAT), whereas the cost of new 8 mm chain is around £4 – 5 per kg. In 2012 the cost of regalvanising has increased, the ratio between the two options being 1:3. So that was clear enough – galvanising was and is well worth doing. Protective zinc is generally applied to steel by one of two methods, either by hot-dip galvanising or by electro-plating. For chain it is almost always the former, although the application method varies. 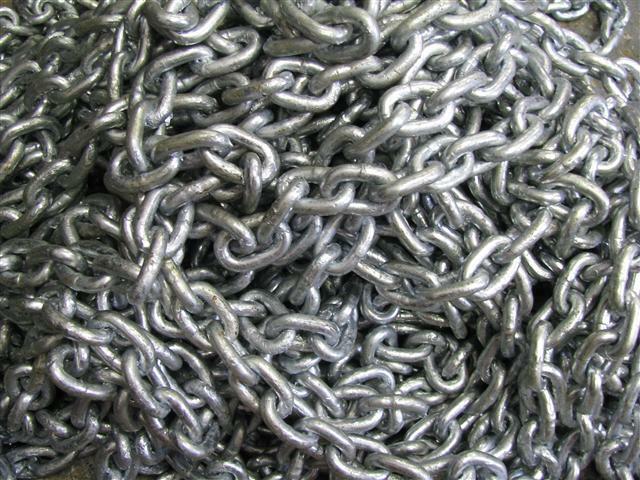 Most galvanisers use a batch process, putting the chain in baskets, immersing them in molten zinc, then shaking off the excess. Through Internet searches I also found that galvanising chain is a specialised activity, requiring dedicated equipment and techniques. One problem is that the links ‘weld’ together when the zinc solidifies. This is overcome in small parts by centrifuging, or ‘spinning’, removing excess zinc. The technique is used for chain by some galvanisers, although the final zinc thickness will be less than with a continuous process. I also learned a new word – shoogling – defined as a small rocking movement. This is a method used by some companies after chain is galvanised, to prevent the welding of links to each other. There are companies throughout the UK who can carry out galvanising. I contacted three local to me, who all advised that there is only one company in UK who specialise in galvanising chain by a continuous process: B.E. Wedge in the West Midlands. The exact method is confidential, for commercial reasons, but basically comprises pickling the chain in hydrochloric acid to remove rust, salt and any remaining zinc, followed by passing it through molten zinc in the galvanising bath. The chain is transported on rollers that are continuously shaken to prevent stuck links. The result is an even, bright layer of zinc of about 55 microns thickness, sufficient to give many years of service in a marine environment. There are one or two problem areas. 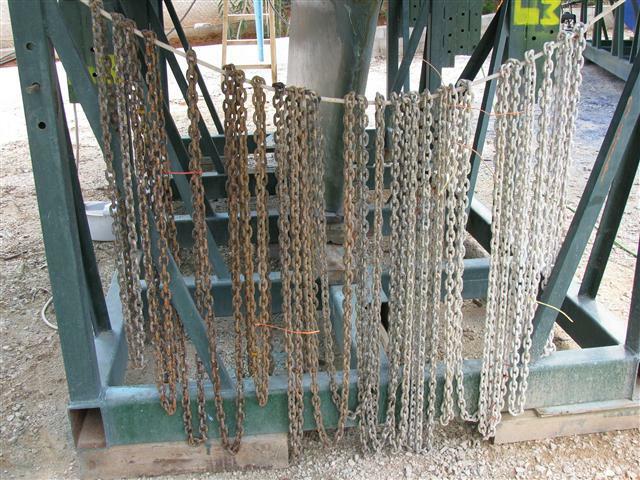 Paint on chain interferes with the galvanising process. It must first be burnt off, the most effective way being to pass it through the galvanising bath first, from where it returns to undergo the full process. This additional step attracts a penalty cost of 50%. There is no minimum order for chain, but it may be necessary to wait until there is sufficient to justify starting the continuous line. This is usually no more than two weeks. High strength chain, Grade 40 and above, may be susceptible to hydrogen embrittlement in the pickling bath. This should be discussed before proceeding. I left my chain with them and picked it up 10 days later. There could hardly have been a greater contrast between its new and regalvanised appearance. The zinc thickness was quite clearly generous when compared with a length of new chain bought at a chandler. A few links were lightly welded together but tapping with a plastic-faced hammer soon solved this. I found no defects such as pinholes, dross or flaking and as far as I could tell the coating was regularly distributed throughout each link. The total cost was £92.00 for 60 metres of 8 mm chain. A very satisfactory job that should last me up to 15 years. A generous thickness of zinc on my chain, sufficient that it is quite difficult to make out the welds in each link. Contrast with a sample of production chain. The amount of zinc appears barely enough to cover the steel. Since I wrote this article I have had a second length of chain regalvanised by the same company. This was a 50 metre length for my motorsailer, Cecilia. Costs of heating and of zinc had risen by 2012, meaning that the savings were not quite so great as previously. The total cost amounted to about a third of the cost of new chain, compared with a quarter in 2010. The quality of the regalvanising was again good, the actual chain being shown in the Windlass section of the site.